There are 195,070 people employed at various pet grooming and boarding businesses throughout the country and each share a universal experience; dealing with an anxious animal. Although grooming is necessary for the maintenance and wellbeing of the animal, it can be foreign territory for cats and dogs alike. The first time a pet goes to the groomer is the most crucial visit; their experience can determine their feelings towards grooming for the rest of their lives. 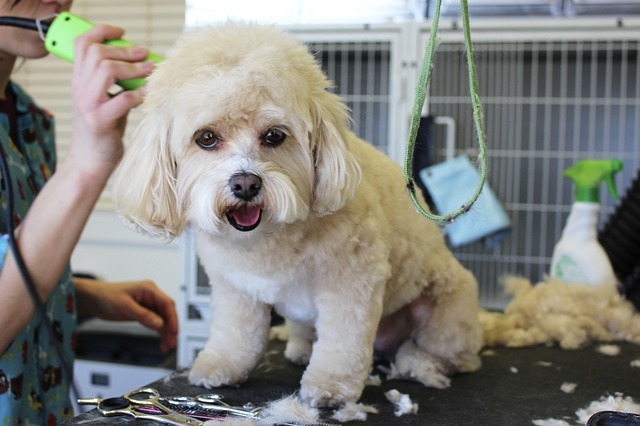 Ease pets into the grooming process by letting them get acquainted with your equipment. Allowing pets to walk around your facilities and play with your staff before the grooming begins is essential in making them feel comfortable. Getting anxious animals to cooperate during the grooming process may feel like an impossible task, but using force will only make it worse. Whether you need to clip their nails or shave their fur, introducing them to each tool you’re going to use will make the experience less threatening for the animals, and easier for you. Simply let pets sniff your tools first, and you’ll show them there is nothing to be afraid of. Another solution to curing animal anxiety during a grooming is to reward them throughout the process. After each time you brush their fur or bathe them, slip them a treat or two to let them know this is a positive experience. When they associate a reward with each part of the grooming process, their fear and anxiety diminishes. Conditioning anxious animals by rewarding them will ultimately make them look forward to their visits to your business. Understanding how you can create the most enjoyable grooming experience for the pets in your care will not only ensure the pets leave happy, but the owners do, too. Want more tips and tricks for your pet business? Check SinglePlatform out on Facebook, Twitter, and Instagram.